We are pleased to announce the release of dhtmlxScheduler 3.6. In addition to a number of bug fixes, this update brings some new interesting features and enhancements. 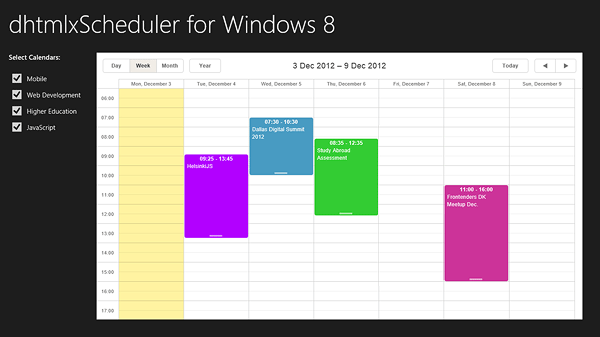 Among them is a special scheduler version for Windows 8 apps. The next feature was added to appease user requests. It’s now possible to configure the order of date and time inputs in the event creation/details form (see the screenshot below). You can order the inputs according to your preferred date format, for example hour-day-month-year or hour-month-day-year. In the Timeline view, we have added the ability to divide the day into equal time intervals (hours) and display them on different pages. Each page shows the events occurring for several hours, e.g. from 8:00 to 12:00, from 12:00 to 16:00, and so on. Users can navigate through hours using the arrows on the top right corner. This feature is useful if you need to “zoom in” the Timeline view and allow users to manage their events or tasks in shorter time spans. Another new great feature is the ability to define the logic in what order the events are displayed in the Timeline view. This feature allows you to organize the events by priority (display important events/tasks first), or by user, or by any custom property. 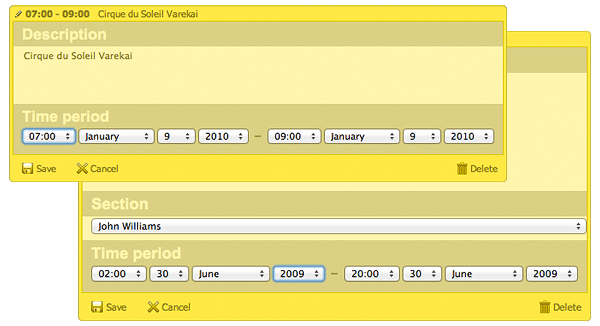 The order is preserved even if users drag-and-drop the events from one calendar cell to another. You can also set different color for each type of events (e.g. red for important). Version 3.6 allows you to export multiple scheduler pages to PDF. In the previous version, you could only export one page at a time. Those who own dhtmlxScheduler PRO will receive this update by email. Do you have a list with bug fixes in 3.6 somewhere? Unfortunately, we do not have such a list. Is stretching of events available in month view also? Do you mean multi-day events? Please explain in more detail what feature you need. Not multi-day events. But single day events only. Currently we need to do customization to increase the height of events and then increase the bar height. Please submit this question to the forum. Our technical team will help you. Will you release latest version of htmlxscheduler with bug fixes on multi-touch and persistence data store? We are going to release dhtmlxScheduler 4.0 for Windows 8 by the end of the next week. I detect a problem when i move an event from a week to an other in the week mode of the Timeline View. The event duration change after each move. Please post your question to the forum. Our technical support team will look into this issue and will give you a reply.